Fence Repair Contractor - RC Fences and Decks Concord, CA. Repair over Replacement – Save Money! 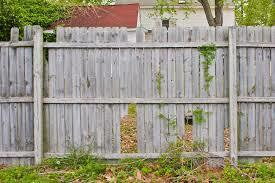 One of the more popular items of RC Fences and Decks is wooden privacy fence repair services. Often your fence is in need of repair but not bad enough to warrant replacement just yet. Therefore we are able to fix rotten posts, broken fence slates, or any other issue with a clients fence so they may squeeze a few more years of use out of it. 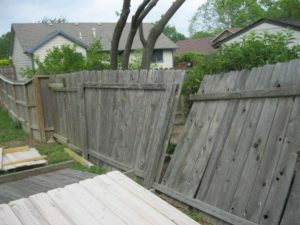 Whether your wooden privacy fence is suffering from a rotten posts, broken slates or storm damage we can fix it with RC Fences and Decks fence repair services. A common issue is many fence contractors failed to install the posts correctly which causes them to rot out and soon fail before the rest of the fence does. Therefore your left with a rotten posts but rails, slates and other parts of the fence still in good shape! Sound familiar, then call RC Fences and Decks of Concord for a free estimate to repair your fence today! More often than not our fence repair services must be made due to a previous fence contractor failing to build the fence correctly. This is the most common when it comes to rotten posts. If the fence posts was not placed in a deep enough hole, they are likely to lean over time or even fall completely over. 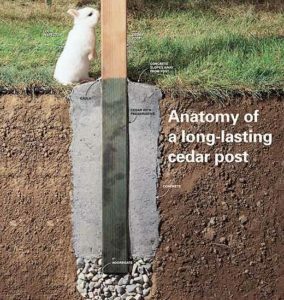 If the concrete was poured below the dirt level, the bottom of the post is in direct contact with soil and even with pressured treated posts rated for in ground contact, which we always use, sooner or later the post will succumb to rot. The cornerstone of a sturdy and well built fence that will last 20 plus years all depends on the proper post installation! We install posts the correct way, which although takes more work and time, ensures our customers have a fence that will last decades not only a few years. Our process for installing posts is time consuming but we have found it to be the best possible way to ensure your fence doesn’t end up rotting. We always place posts at least 1/3 of the height of the fence underground. In other words for a 6′ tall fence, the posts are placed in the ground a minimum of 2 feet. First we would dig at least a 30″ deep hole. We then place 6″ of drainage rock compacted at the bottom of the hole. We then take our pressure treated posts and soak them in Copper Green, a preservative, for added protection. The post is then placed in the hole and we add 2″ more of rock around the post. 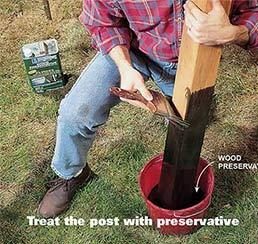 This minimizes the likelihood that the concrete will form a pocket below the post which will eventually fill with water and allow the post to sit in a pocket of water causing accelerated rott to the wood. Next we plumb the post, add support braces and then pour the concrete. We always mix our concrete prior to placing it in the hole instead of the common technique of pouring the dry concrete into the hole, adding water and then trying to mix it in the hole. With this time saving technique the concrete is never fully mixed and therefore never achieves its full strength. We add concrete all the way past the dirt level at least an inch or two. We then form the concrete at the top to slope away from the post ensuring water drains away from it! 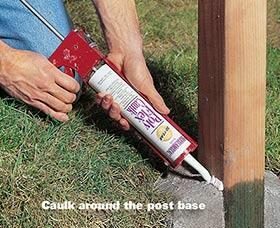 Lastly, we use a caulk made for adhering to concrete and we caulk around the posts to provide a final barrier to water and moisture getting in between the wooden posts and the concrete. With this technique you can be sure your posts will last root free for decades to come! Repairs Only Go So Far! *A common issue we run into and therefore feel the need to inform our clients on is that repairs can only go so far. 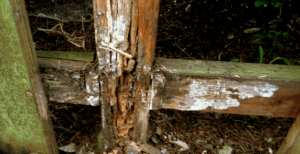 It is a lot of work to replace even a single post, therefore if several of your posts are rotted out, it is often a better idea to go ahead and replace the entire fence or at least rebuild it! Remember, these repairs are only a “bandaid” of sorts and will give you a few more years out of your fence but will never be the same as replacing the entire fence! Were open right now, give us a call! RC Fences and Decks 2019Construction Landing Page Pro Theme by: Rara Theme. Powered by WordPress.